when you see a flower and are thankful for the blessing. when tomorrow’s hope means more to you than yesterday’s mistake. when you don’t need a mirror to tell you. Strengths are developed as you grow in character and integrity. They influence your thoughts, feelings, and actions. Skills aren’t strengths. Strengths are built on strong morals and principles that lead to well being for yourself as well as those you touch, and they are priceless. Be proud of how far you have come despite the obstacles in your path. You are stronger today because of those obstacles. In reality you are stronger than you think. “I’m sorry my tattoo says “Michael Jackson 1958 – Forever” and not “I love Michael Jackson – Please give me crap” as so many people seem to think it does. I’m sorry I let you walk by me wearing shirts with Iron Maiden, Metallica and the like and I do not comment on those. I’m sorry for not badmouthing you when you brag about having been to a concert with Bruce Springsteen or any other singer. I’m sorry for loving a man who was forced to go on trial by a racist District Attorney who was determined to bring him down, no matter what, and who even faked the evidence in an attempt to bring him down. I’m sorry for loving a man who during his trial was bullied by the media while the so-called “victims” were caught repeatedly lying under oath. I’m sorry for loving a man who was found “Not Guilty” and was never convicted of any crime in spite of Herculean attempts and a witch hunt which spanned for more than a decade. I’m sorry for loving a man who was under investigation by the FBI for more than 20 years and was found to be innocent and not guilty of anything illegal. I’m sorry for loving a man who was raised in the spotlight and sacrificed his childhood to please the world with music and art. I’m sorry for loving a man who was hounded by filthy paparazzi and media personalities who to this day call themselves “serious reporters”. I’m sorry for loving a man who revolutionized the music video medium. I’m sorry for loving a man who broke the racial barrier on MTV. I’m sorry for loving a man who was and still is personally responsible for cutting the number of people starving to death in half in the 1980’s and 90’s because of one song. I’m sorry for loving a man who created the album which to this day ranks as the Number One Album of All Time. I’m sorry for loving a man who saw the beauty of Creation in every animal and human being. I’m sorry for loving a man who said, and I quote: “I would slit my wrists before I would hurt a child”. I’m sorry for loving a man who granted sick children their final wish; a day of joy and laughter, in his magnificent garden. I’m sorry for loving a man who was a shining Biblical example of how we should treat each other: with love, respect and dignity. I’m sorry for loving a man who simply wanted to be loved all over the world, everywhere he went. I’m sorry for loving a man who during a 16-month long worldwide tour purchased a piece of equipment to each children’s hospital in every city he went to in 15 countries. I’m sorry for loving a man who in the middle of a concert called out to security to remove a bug off of the stage floor so he wouldn’t step on it. I’m sorry for loving a man who wanted to please the media by changing his appearance, only to learn that they bullied him even more fiercely than before. I’m sorry for loving a man who donated more than 300 million dollars to charities around the globe, to ensure that unfortunate children and families were given a second chance in life. I’m sorry for loving a man who brought together people regardless of gender, color or creed, because of his music and art. I’m sorry for loving a man who, according to his own mother, danced already as a baby in diapers to the rickety beat of the washing machine. And most of all, I’m deeply sorry for loving a man whose only crime was to want to heal the world with a love so pure it scared people who didn’t recognize it. Thank you Jacinta Feyling for allowing me to share your thoughts about Michael Jackson. Feel free to add your comments about Michael. Please join with others around the globe in holding prayers for our world at 8:00 PM in your time zone on super full moon June 23, 2013. Astronomers call this sort of close full moon a perigee full moon. The word perigeedescribes the moon’s closest point to Earth for a given month. Two years ago, when the closest and largest full moon fell on March 19, 2011, many used the term supermoon, which we’d never heard before. Last year, we heard this term again to describe the year’s closest full moon on May 6, 2012. Now the term supermoon is being used a lot. Last month’s full moon – May 24-25, 2013 – was also a supermoon. But the June full moon is even more super! In other words, the time of full moon falls even closer to the time of perigee, the moon’s closest point to Earth. The crest of the moon’s full phase in June 2013, and perigee, falls within an hour of each other. Synchronized prayers are very powerful! Full moons have historically been a time of release, and a time of letting go of darkness and negative patterns. Please circulate and share this prayer vigil widely. The more people praying the more powerful our prayers’ effects. Always pray for Mother Earth and others. 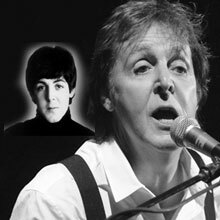 It’s hard to believe that Paul McCartney is now 71 years old. He is like the energizer bunny he just keeps going and going. And he gets better with every year. Right now he is on a world tour and each concert he performs for three hours live with no pre recorded music or vocals. That’s the way music should be performed and the crowds love him just as much as they did 50 years ago. Thank you Paul for all the years of entertainment, inspiration, and beautiful music you have provided for the world! Happy birthday and may you have many more!